Chateau du Cros Loupiac Archives - Write for Wine: It's Wine O'Clock Somewhere!Write for Wine: It's Wine O'Clock Somewhere! 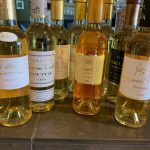 Last week, Snooth invited us to a virtual tasting of eight samples of sweet, golden Bordeaux wines with savory foods. Master of Wine Mary Gordon McAdams led the informative and fun online discussion. According to Snooth, “we must shatter our assumptions about sweet Bordeaux wines.” We agree. So think about these pretty wines as an alternative on your holiday table.